Murals around the perimeter of the first hall originally adorned one of the townhouses in the square (later "Zvolen Rectory"). The house itself in its original form is no longer there. Before its walls were demolished, transfer technique was used to move the paintings onto new carriers and they were installed in the Castle. Its decorative elements are reminiscent of the so-called Green Room, rooms decorated with plant ornaments interspersed with figural scenes. Zvolen is also important for its sacral scenes (Flagellation of Christ, Crucifixion, Saint Elizabeth et al. ), but it also includes playful profane scenes from hunting environment (rabbits with a hunter, a bear playing, players of trik-track and others). The decoration was probably painted during the 1460s; the painting of the Green Chambers Thurzo house in Banska Bystrica from the late 15th century is slightly younger yet very similar. The wall paintings are accompanied by examples of Gothic sculpture and painting from the second half of the 15th century. The second room is dedicated to the Master Paul, the most famous artist in Slovakia in between Gothic and Renaissance. SNG owns copies of three statues of the main altar of St. James in Levoča, which were created by Czech restorer brothers Herman and Viktor Kotrbovec in the 1950s to mark the restoration of the altar, using the original techniques and in a one-to-one ratio. In addition to the three central sculptures, Madonna, Saint James and Saint John the Evangelist, there are also plaster casts of the four reliefs from the wing altar (scenes of martyrdoms of St. John and St. James) presented in the hall, as well as copies of several other sculptures of this Levoča workshop. The whole context is completed by several examples of authentic Spiš sculpture from the end of the 15th century, as well as two panels, originally part of wing altars. The image of a complete altar with a retable, integrating painting, sculpture, architecture and art craft is mediated though the central artefact in the next, third, room - Altar of Our Lady of the Rosary from around 1510 to 1520. It got to our country only at the beginning of the 20th century as a collection item of the Palffy collection in Smolenice. Originally it probably comes from Carinthia or Styria. In addition to the medallions with the Passion cycle around the perimeter of a Rosary surrounding Madonna, iconography of accompanying female saints also attracts attention. Images of Saint Barbara and Saint Katarina are abundant in the mining environment (for example in Banská Bystrica and Banská Štiavnica). A predella also belongs to this iconographic context, on which is the painting of the Holy Kinship - Jesus' family through the maternal line with Saint Anne and the Virgin Mary. Sculptures and murals on the surrounding walls illustrate the contemporary stylistic context, partly even on our territory. The focus of the fourth room is on the themes of Christ's Passion. 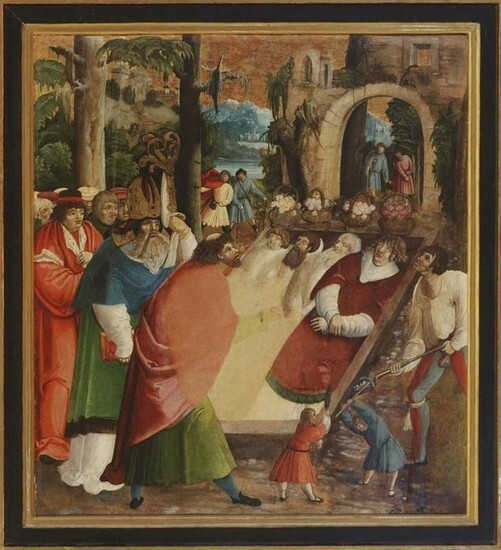 They are presented in a high quality paintings so-called Danube school (especially Carrying the Cross from the circle of the Master of the Altar in Pulkau, around 1520). Statues of Man of Sorrows are largely represented in our collection as a type of Christ figure, whose function was to arouse an emotional response in the viewer by pointing to the wound and therefore appeal for a support of his prayers. The altar in the middle of the room is dated to 1527 and comes from an unknown Spiš location. Passion scenes on the fasting side are combined with paintings from the life of St. Nicholas on the festive side. The fifth room represents the other saints of the late Middle Ages. Besides the two altars of Liptovská Dúbrava, around 1520, and in addition to Madonna, Saint Barbara and Saint Nicholas, the visitor also gets an opportunity to become acquainted with the less frequent hagiographic stories - e.g. Saints Cosmas and Damian, Saint Lawrence or Saint Stephen the Protomartyr. The panorama of art of the late Middle Ages is therefore concluded by recalling features of Gothic sculpture and painting, which formed an inseparable artistic types in the context of the often challengingly decorated altars. Many of the oldest works of wooden sculpture in the collection of SNG are gathered the last room. The focus of attention is on a reconstruction of the Altar of the Virgin Mary from Lomničky (around 1420-1440). The context is provided by several much older statues exhibited here: Madonna of Teriakovice (before 1350), Saint Nicholas of Gánovce (around 1320), Madonna of the Slovenská Lupča (around 1350) Madonna of Olcnava (after 1350) and others. Absolutely oldest exhibit on display is Enthroned Madonna of unknown, probably southern German, provenance from around the 13th century. The statues are usually installed in the exhibition to allow visitors a view from all sides, and even view of the wood blocks, construction sculptures, the remains of their polychrome and so on.